Pic. 4 Solar corona outline seen at 96% obscuration, around 3min after totality. Exif: 300mm, 1/4000s f/5.6, ISO 100, cropped. Click to enlarge. A solar eclipse is the most spectacular natural phenomenon, as we can see on Earth. It induces at least a dozen or so another events, which occurrence can be observed during this time. 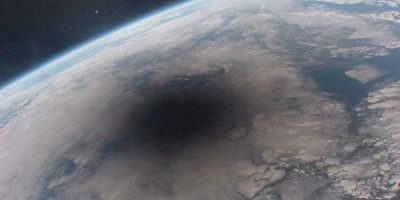 In this article I would like to list a 10 the most intriguing and uncommon phenomenas, which an observer is able to see during the solar eclipse event. Changes of illumination – an understandable thing is, that the light level and radiation changes throughout the solar eclipse. People don’t really realize the light level changes. The basic reason is that the human eye responds logarithmically to stimuli according to Fechner’s law (Fechner, 1860). Secondly the decrease in radiance of the blue sky and our surroundings is the same as that of the primary light source, so that contrast remain unaffected (Koonen, Hinz, 2009). Moreover the human eye adapts effectively to to changes in the overall illumination, likewise most of camcorders and cameras. Until observer won’t look on some fixed light (like remote street lights, which gradually gain the brightness) at once the illumination difference may not be noticed by him. The sky light may be considerated as attenuated sunlight up to at least 99,8% obscuration (Sharp, Silvermann, Lloyd, 1971) or 99,7% obscuration (Konnen, Hinz, 2008), when decrease in sky-light radiance starts to stagnate with respect to that of the Sun. It’s also worth to mention, that more or less till 98,7% obscuration (depends on the lunar radius and light wavelenth) the brightness of Sun and sky decreases with respect to noneclipse conditions (Konnen, Hinz, 2009). The illumination change in not a linear progress. Because the light level changes correspond with a logarithmic function, at the very beginning of the eclipse the attenuation won’t be noticeable. As the Moon covers more and more the Sun this effect is more noticeable, especially when eclipse magnitude exceeds 0.9 (Konnen, Hinz, 2009). Moreover the illuminance level changes also throughout the total phase. The sky light consist of multiply scattered light from outside the umbral region (Sharp, Silverman, Lloyd, 1971). Usually a moment around the mid-eclipse is the darkest, but not always. The details of my observation and measurements are available in this article. Pic. 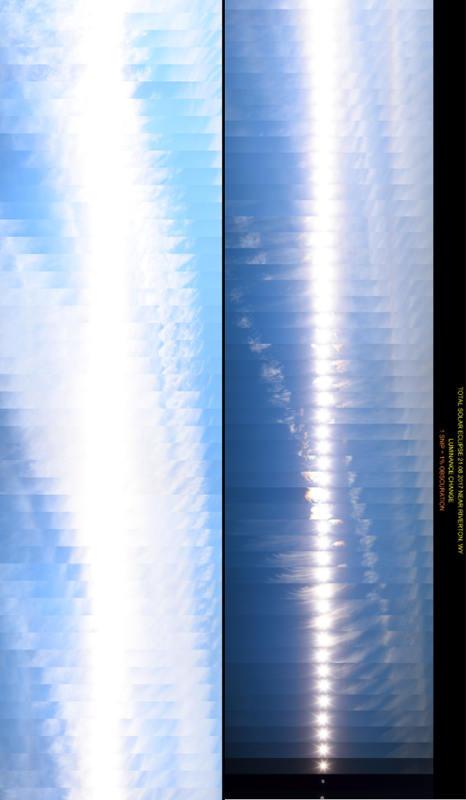 1 A photo sequence of illumination changes throughout a whole partial phase of 2017 solar eclipse, made by vertical snippets, where 1 snip correspond to 1% obscuration changes (based on Bartosz Wojczyński timelapse images). See an original image here and here. Pic. 2 Visual light level changes throughout the total phase of 2017 solar eclipse. 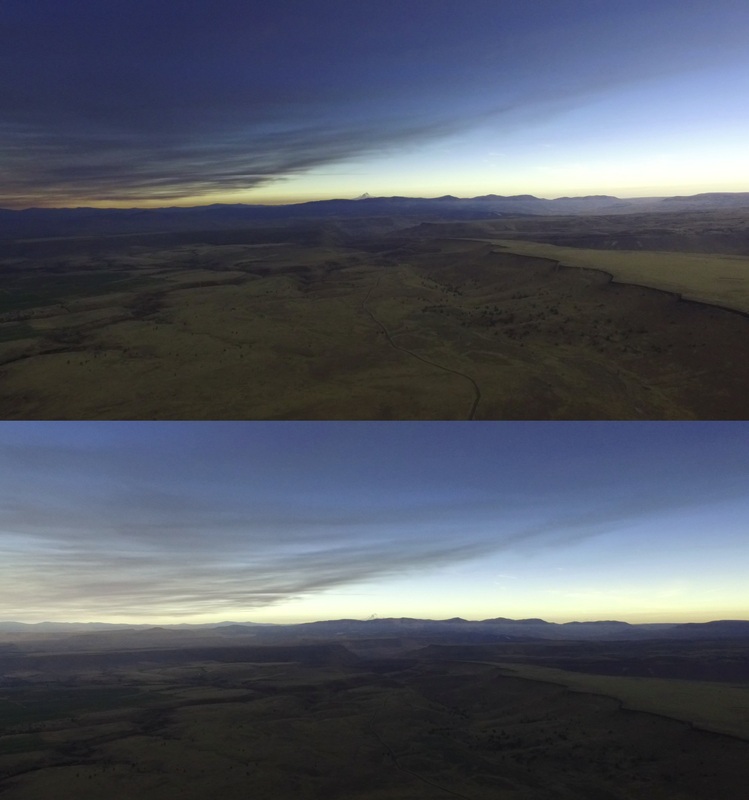 Sky brightness and colour changes – along with the light level a sky brightness surface changes. These changes can be observed rather when Sun is obscured in 50% or more. Sky become darker and also changes a color a bit. A reddish tint appearance is to be seen for solar obscuration bigger than 50%. I wrote about this nearly 2 years ago. 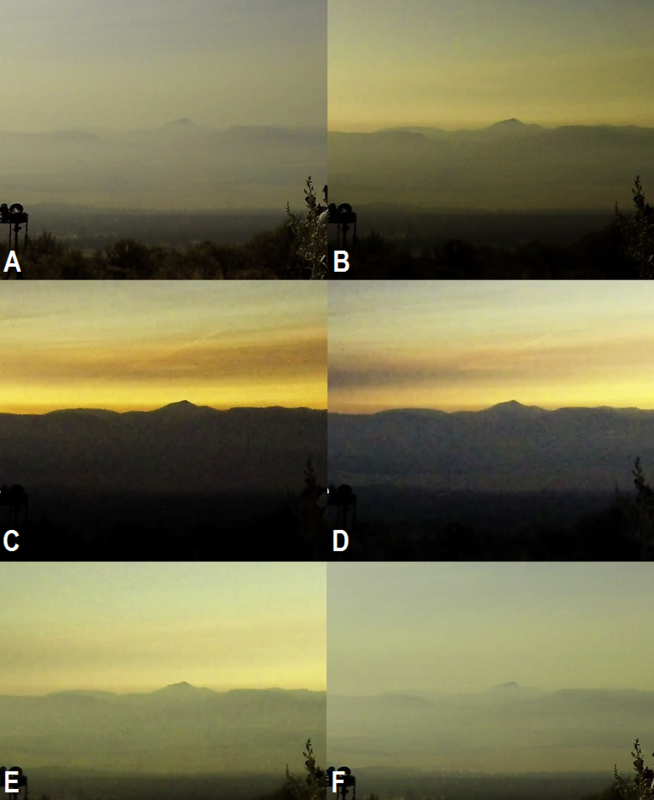 At the deepest phase of partiality a sky surface brightness and color changes are considerable. During the totality sky is similar to the blue hour period of twilight. A zenith sky is navy blue, whereas the horizon around, illuminated by airlight has an yellowish appearance likewise during civil twilight looking towards a solar point. Sometimes we are able to spot a reddish clouds. As the totality progress the sky brightness and colour also changes as per the description of previous article. Pic. 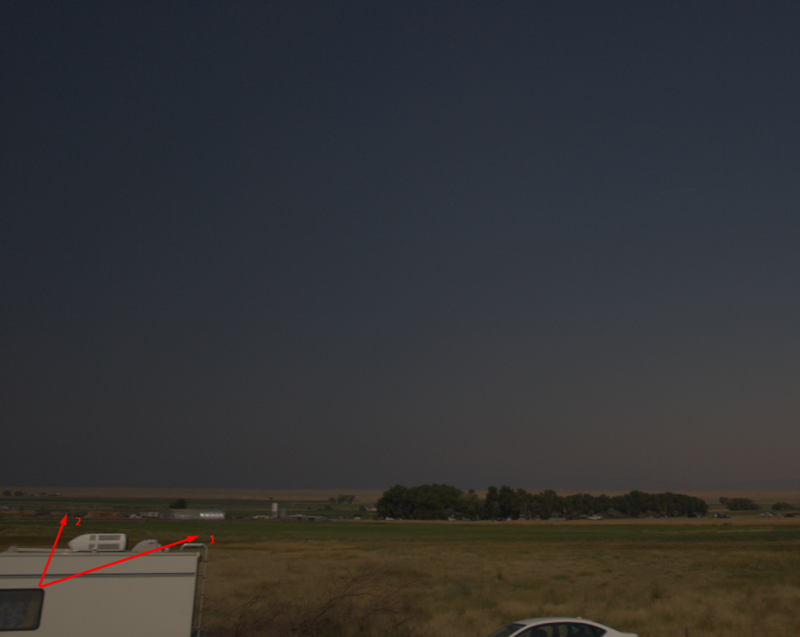 2 A sky brightness just after beginning of 2017 total solar eclipse in Wyoming, USA. You can see still illuminated yellowish clouds as well as bottom part of the sky. Pic. 3 Sky brightness around mid-eclipse towards following directions. 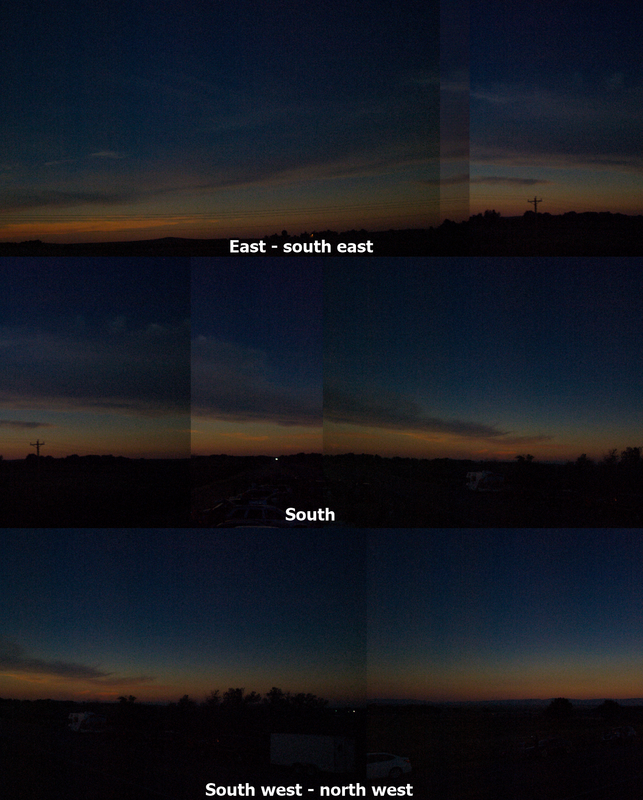 Near the horizon you can see some reddish and yellowish high-level clouds. Exif: 14mm, 1/20s, f/4.0, ISO 400. Click to enlarge. 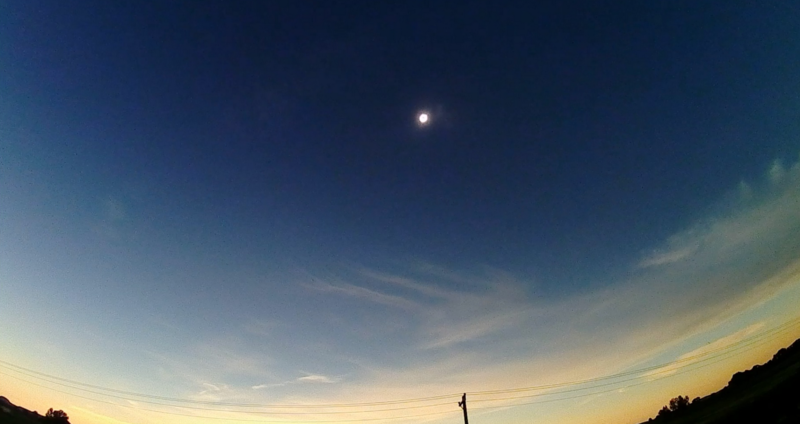 Solar corona outside the totality – an interesting phenomenon to be seen even up to 5 minutes outside the totality, when a sunlight is weak enough. The solar corona has a brightness nearly equal to full Moon, thus it could be easily seen during deep partial phase, when lunar disk almost fully overlap with solar one. Unfortunately the solar corona, that appears on the opposite side of the crescent is literally washed out by its much stronger gleam and remains invisible for the observer. There are solutions, that can help you to spot the solar corona outside the totality. If you don’t have a binocular just block the light coming from thin solar crescent and try to spot a fuzzy arc next to your thumb. It should work at least 2 min before or after totality. When you have a binocular do analogically, placing the sunlight outside your view (otherwise it can be dangerous for your eyes!) to enable you to see an discernable fuzzy arc even up to 5 min before or after totality. During the 2017 eclipse observation I used a long lenses Nikkor f3.5-5.6 55-300mm for the solar corona observation outside the totality. In order to capture the solar corona next to the crescent sun I used the light-fall feature of the Nikkor 55-300mm lens, that could save my sight and camera a bit diminishing a major light at once. At 300mm the fuzzy arc was looking big likewise you could watch it through a good binocular. Finally I made it, and discovered, that solar corona can be visible upon 93% obscuration, which is amazing! Interesting can be also the point of lunar and solar disk cross, where some prominences are to be visible! For deep annular eclipses it can be noticed just before 2nd and after 3rd contact, which has been roughly described in this article. Fleeting shadow – when close to the totality is easy to spot a shadow moving fast across the sky. The speed of the lunar shadow depends on a few factors, where the most important is solar altitude above the horizon. Due to this the umbral speed can vary from around 600m/s even to 55km/s (Carton, 2011). This enormous speed is to be seen especially on the sky and high-level clouds just before and after the totality. The sky colour and lunar shadow appearance changes significantly every second, especially when crossing the zenith sky. Sometimes this phenomenon is also possible to see on remote mountains in some rough areas. Read more about it here. Pic. 5 Approaching lunar shadow, at 30-40s before totality. These photos has been made between about 3s interval. 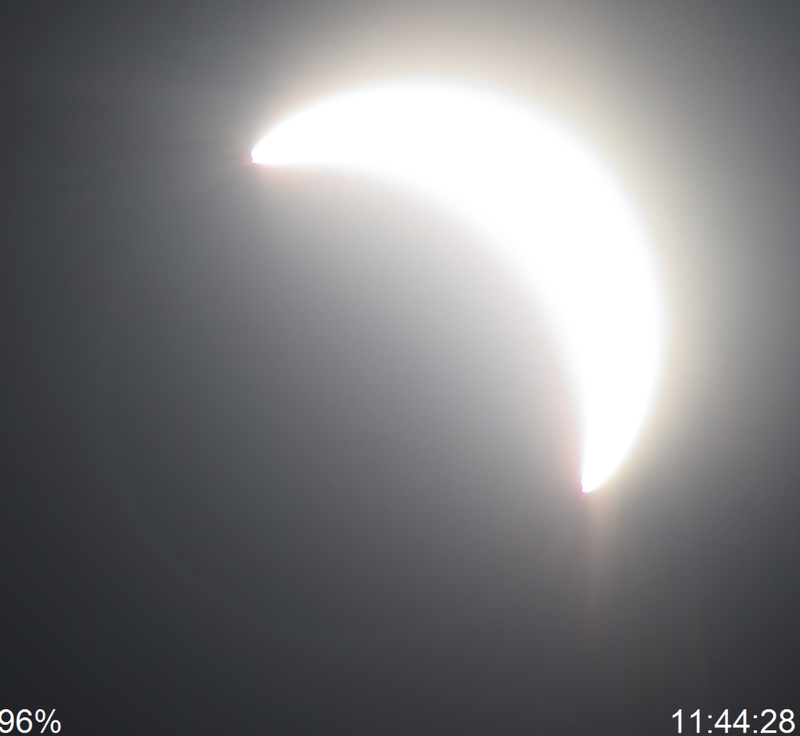 The darkening process looks very significant at this stage of solar eclipse. Pic. 6 Fleeting shadow above the PTMA (Polish Society of Amateur Astronomers) observation point near Riverton in 2017 (credits: Piotr Dzikowski). 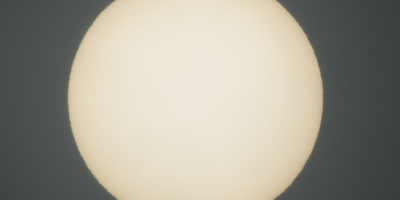 Prominences movement against the lunar disk – very interesting event, quite easy to spot when looking on the Sun through binoculars or long lenses. Prominences and solar chromosphere appear in pinkish colour. Is really hard to spot it by naked eye, so better equip with at least a small binocular. The longest prominences are quite rare, but when occur we can see them even for entire totality. The moment after beginning and before finish the total eclipse gives us the opportunity to see a lot of prominences surrounding the solar limb. Most of them are relatively small and can be seen as an additional, pinkish layer of solar atmosphere. More about the prominences appearance during the totality has been mentioned in this article. Pic. 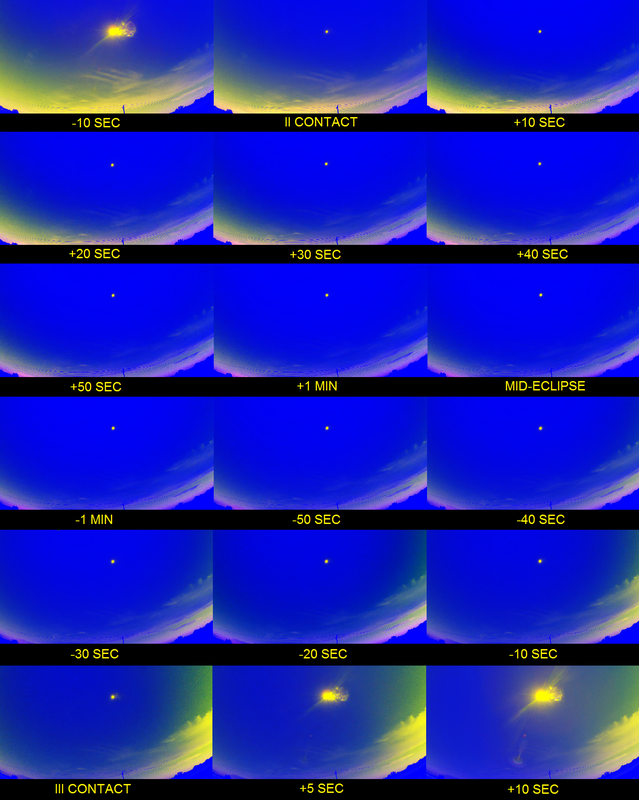 7 Prominence movement against a lunar disk as captured during 2017 total solar eclipse in Wyoming by PTMA (Polish Society of Amateur Astronomers). 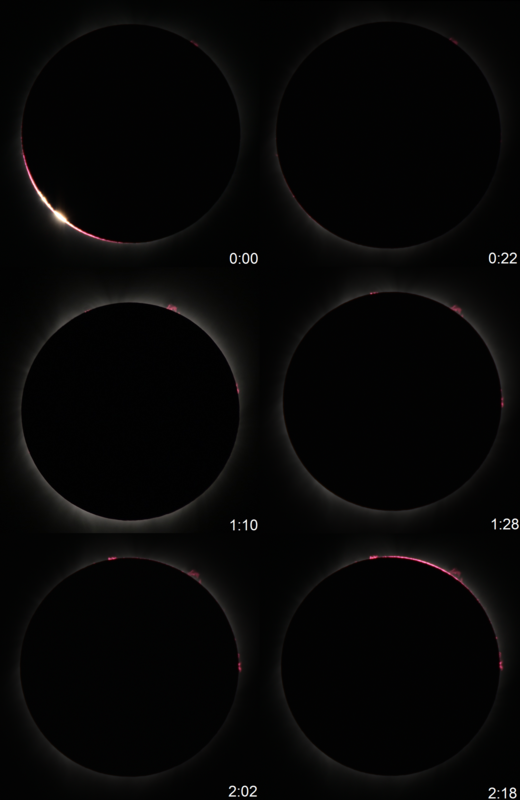 The bottom images show the prominences not visible at the earlier part of 2017 total solar eclipse. 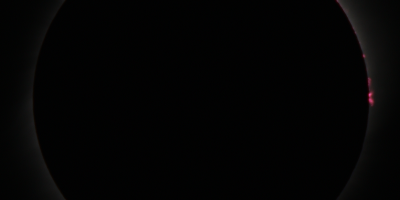 Ground darkening – the event associated with the Moon’s shadow approaching. The umbra presence is visible on the ground as such is on the sky or clouds. It looks much better from drone perspective or some elevated observation venue (Pic. 8) Basically the surface radiation changes throughout a whole partial phase of solar eclipse as the solar irradiation drops. The same situation is with the irradiation level of both a primary light source and surroundings, that decreases equally we cannot spot it when the eclipse phase is not advanced enough. The ground darkening is to be seen shortly before the totality and just after. Is better to observe it from some elevated place. The ground darkening is to be seen for a dozen or so seconds only. Pic. 8 A ground darkening seen from drone perspective above the Madras (OR) area in August, 2017 (credits: Mateusz Windak). Pic. 9 A faint ground darkening can be captured from elevated observation place like car deck. However it won’t be the same effect like from some mountain or skyscraper. Exif: 1/25s, f/4.0, ISO 400. Local shadows movement – a very interesting occurrence, which takes place during eeach totality. To watch it we need a white sheet with at least a few rough shapes. Gnomon can be helpful also. In the result you will be able to see how the local shadows change throughout the totality. An the beginning the shadows will head almost on the opposite direction against by the end of the eclipse. The details of this observation has been described in this article. Pic. 10, 11 Shades movement throughout the 2017 totality seen on a plain-coloured rough surface: 10 – in Wyoming, 11 – in Oregon (credits: Carsten Jonas). Surface colour changes – another very interesting observation, that can be carried out by the way of shadow band chasing. Likewise in previous observation the plain-coloured sheet will be required. In effect of the shadow movement and light scattering from the different parts of the sky throughout the totality, a different colours of light scattered from outside of the umbral region will be visible. The details of this observation I have described in this article. Pic. 11, 12 – Light scattering colour changes throughout total phase of the eclipse: 11 – seen in Wyoming; 12 – seen in Oregon (credits: Carsten Jonas). Significant changes of visual range – is haze-dependant and will be the best visible under the high density of atmospheric aerosols. The objects, that are normally invisible outside the total solar eclipse conditions suddenly emerge on the horizon as the umbra approaches. Read more about it in this article. Pic. 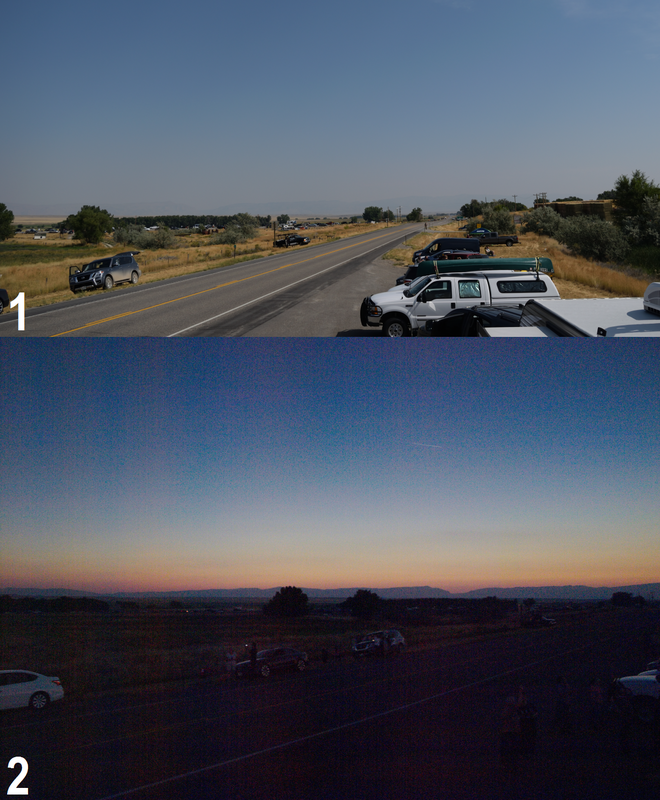 13 Owl Creek Mountain range visibility prospect from U.S 26 Hwy near Soshoni at the partial phase and during totality. Pic. 14 Visual range changes towards Grizzly Mountains as seen from the vicinity of Madras town in Oregon (credits: Carsten Jonas). Read the details about sequence in this article. Dark shadow cone – which is to be visible mainly towards near-solar direction, where a forward scattering takes place. A shadow cone is less pronounced far away from the Sun due to backward scattering. I can occur both shortly before and just after the totality depends on the position of the Sun in terms of the umbral path across the sky. For example when eclipse takes place in late afternoon being on the shadow-in sky at once. Then the observer will see the dark shadow cone just before the totality. During the 2017 total solar eclipse, which I was watching around noon the dark shadow cone was observed on the shadow-out sky, being located closer to the Sun. In general the dark shadow cone can be clearly visible up to 40-50 seconds after or before total phase, which corresponds to 99% obscuration. I was found it during my private light level measurements, which has been described before. Pic. 15 Perfectly expressed shadow cone towards near-solar direction, just after finish of 2017 total solar eclipse in Wyoming (credits: Piotr Dzikowski). 1. Carton W.H.C., 2011, The speed of the lunar shadow on Earth during solar eclipses, (in:) Journal of the British Astronomical Association, vol. 121, no 2 p.105-108.